The world of technology has only recently begun to design services for farmers. But the numbers show that this line of business is already growing rapidly. Investment records are broken every semester. Underlying this development is the boon of the huge amount of data that a farm now generates. Like every other human being, farmers do book keeping, are active online, and use smartphones. They use such tools to solve problems on the farm, and by doing so, they’re generating data. There is also farm machinery, loaded with sensors generating lots of data. By combining such farm operations data with other data repositories, like open satellite data on water tables, precipitation, and nutrition data from the feed manufacturer, etc, data can be combined into useful applications that can help with farm management. Despite the opportunity for the developer to build valuable solutions, there are also barriers that significantly obstruct adoption of digital solutions for farm management. An important barrier is created by technology solutions imposing certain implicit requirements regarding a farmer’s level of data saviness, to collect, organize, and distribute data. Even farmers who do understand the value of data management, generally don’t use computer or web-based tools. The transfer of farm management practice to an online environment, is hardly seamless, and this transfer problem is a problem for many companies and startups that are developing services in this space. More often than not, I see solutions being launched that are at quite a distance from the kind of tech usability that a farmer can muster. A rule of thumb for nailing product design is that you can best meet your farmers where they are. To help position where the farmers you’re targeting are in terms of tech saviness, I’ve developed a model form making farm data personas. This model is presented below. The basic idea is that any farmer, regardless of the technology, has to follow a flow of datamanagement in order to utilize and implement insights drawn from data in the farming practice. 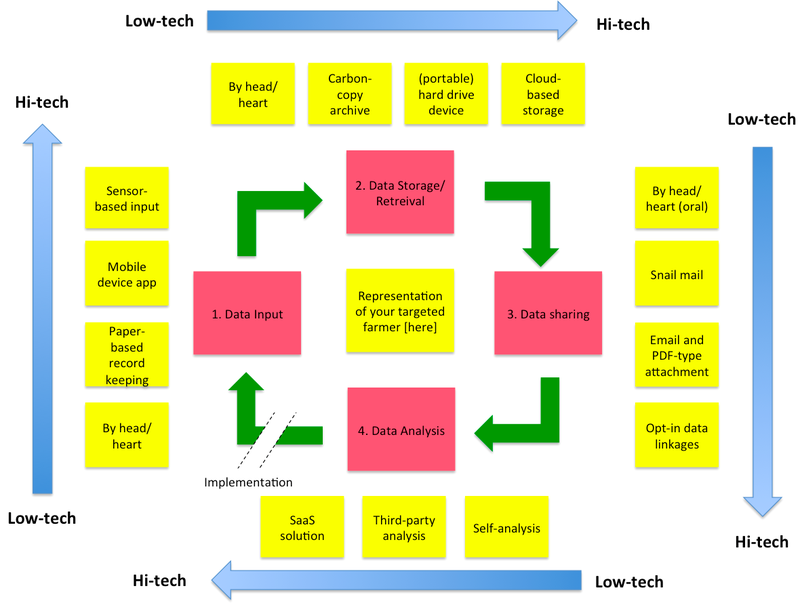 This datamanagement flow consists of 4 steps: Data Input, Data Storage/Retrieval, Data Sharing, and Data Analysis. Next to profiling farmers according to their tech saviness, this model can also be used to indicate what level your solution currently requires your farmers to be in. By comparing these parameters, you can start to see, and understand the gaps. Lets take an example of a solution of herd management for dairy farmers. Say you have an idea for a SaaS analysis solution, to offer online software for dairy herd management, like Farmeron. You will need to figure out a way to connect all the necessary data flows to feed your analytical solution. You want farmers to somehow get their cows to the cloud for analyzing herd performance, and you’re going to need a way to get them to digitize their input. Once you’ve identified this gap, the question then becomes what intermediate steps you can build into your solution to take farmers up the tech ladder. Can you redesign your product to include a learning curve, which will take your farmers on a journey to comprehend your solution, take control, and eventually make it fully usable? Sticking with the example of Farmeron, they’re streamlining their person-to-person onboarding service with other support tools to educate farmers, and keep the learning going. This is something they had to configure on the fly whilst already being deeply rooted into their developed solution. The upshot is that agtech initiatives will likely need to design for the farmer’s learning curve. Adoption for agtech solutions will be slower, and acquisition costs relatively high compared to other tech industries. This is something startups in this space will spend of lot of time on, and their investors will need to provide for the adequate runway. Thanks to some valuable discussions I’ve had about this model with my colleagues Lan Ge, and Marc-Jeroen Boogaardt at Wageningen University in our Farm Digital project, and also with my dear wife Anne Bruinsma, who happens to be a leading figure in agtech with Hackwerk Advies. According to the IFAD (International Fund for Agricultural Development), 3 billion people in developing countries live in rural areas. Agriculture is the main source of income for 86% of this population. Within this farming community, smallholder farmers make up the bulk of farmers (for more stats see the FAO rural economy fact sheet). Arguably, they have contributed substantially to the growth that many developing countries have experienced over the recent few years, not unlike SME’s being the motor behind Western economies. Smallholder farmers are thus an important group for working together with in our global ambitions of creating social and economic development (as demonstrated by the UN initiative of proclaiming 2014 to be the year of the family farm). One of the leading strategies in developing smallholder farmers is providing them with knowledge and information on agricultural practices. The idea is that this will improve practices, make production more sustainable, and improve operations of the market. Given the increase in dissemination of (mobile) technology communication devices, there also appears to be a huge potential for reaching scale with ICT’s in outreach of these information and knowledge dissemination approaches. I’m skipping dinner tonight to save up for airtime so I can call that trader which has recently been asking specifically for that variety of mangos. It will save me the hassle of getting produce transported on market day and getting a raw deal in any case. There is thus a huge gap in understanding, aggravated by the sheer number of people we’re talking about, and we have little basis to relate. As there is no substitute to fill this lack in understanding, smallholder farmers are oftentimes unfittingly lumped together in service and development program designs. There is no basis for targeting innovations to specific groups, nor obtaining specific feedback about what works for whom, and what doesn’t. The result can only be that a lot of the available information and knowledge doesn’t arrive or ‘stick’. A majority of smallholder farmers is likely to be underserved and under-utilised in their capacities to contribute to economic and social development. Rules and systems that apply to the informal economy context, as well as business models that are currently successfully serving farmers. The role of community and networks, and their social conventions and taboos, which make up the existing ecosystem in which the farmer organizes her life. Lastly and most importantly, we need to understand farmers’ aspirations, and how to appeal to those aspirations, to provide an adequate basis of relation. It is evident that such research needs to be done, but it shouldn’t be done for research’s sake. Rather, understanding needs to be turned into actionable insights. 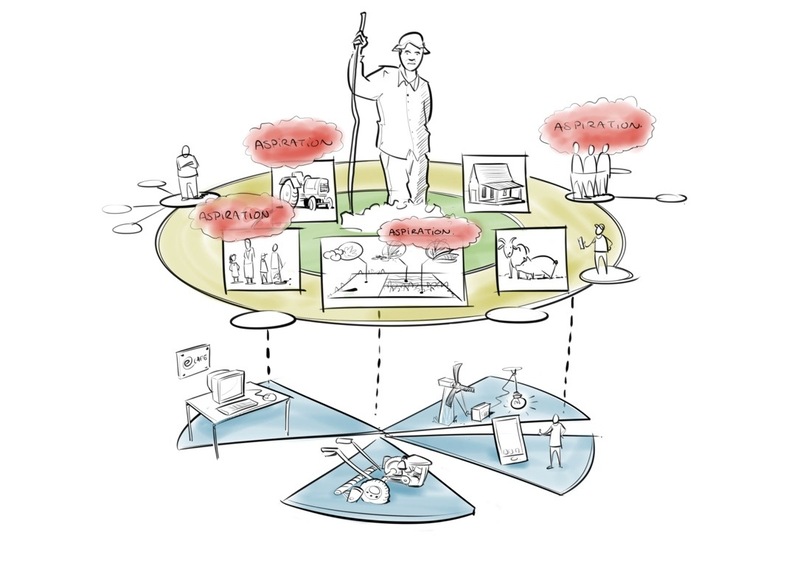 What if we could develop processes, tools, and personas which would aid in segmenting farmers in a specific context for targeting innovations? Support materials, which would capacitate companies, CSR initiatives, and dedicated organizations working with smallholder farmers to design and build for their specific purposes in agricultural product and service development. The aim would not so much be to directly provide solutions, but more so to put the design process and tools into the hands of the people who are most closely related to the problems at hand. On top of that there would be a need for continuous adaptation, tailoring, and distribution of such a resource to different and changing contexts, as developing country economies are in continuous growth flux. Boldly stating, I say that such a resource would need to be developed and made available in the form of an organisation with a public purpose of overcoming our current common barriers to purposeful marketing to smallholder farmers. This would be a social venture, which would maintain itself by publically providing, tools, processes, and basic insights to customers. Furthermore this organisation could help out in tailoring to specific business and service development interests, based on agricultural practices, but fanning out into other areas like finance, insurance, farming input sales, sourcing practices, extension services, agribusiness sourcing, etc. To give the vision a name, I have dubbed this organization Ardhi, which is a holistic term in Swahili signifying soil, ground, or suitable (farm)land. Now I do warn that there is no clear fix for this initiative. We have the basic design tools and technology resources available, but they need to be tailored and refined towards a new market setting through the only way possible: practical experimentation and learning. It will thus be a journey, one which I would like to invite you on to as well. 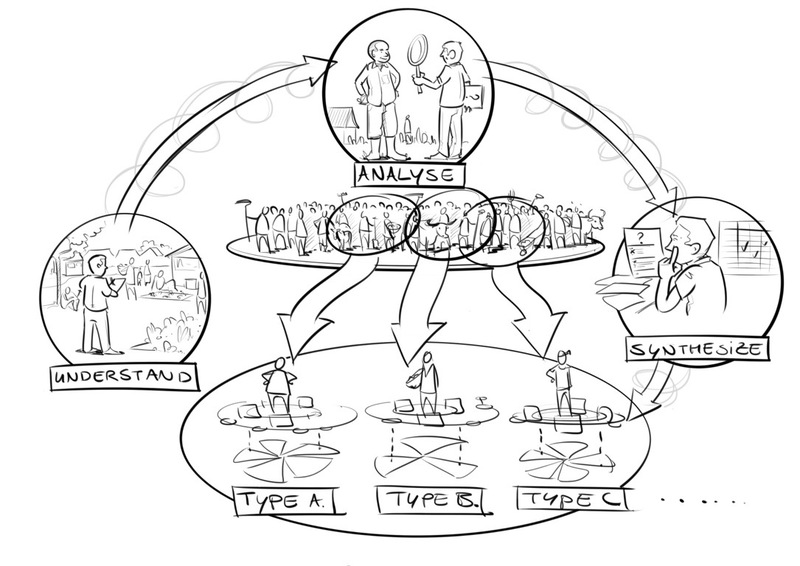 Testing research process and tool prototypes, and applying preliminary insights- Private sector and NGO parties collaborating with private sector who are interested to obtain and apply early insights and actively co-create methods and materials with us. Providing broad-based funding support for deep-dive research to develop materials and insights, and seek the limits of their application. – Funding organizations that support the idea of strengthening the ecosystem of service and product development for smallholder farmers. If you are interested to be involved, then do make yourself heard by dropping us a bit on your background and interests here. We look forward to hearing from you, and hopefully engaging with you in the near future! Do keep track with the progress of our journey under the Ardhi category of posts that will come.